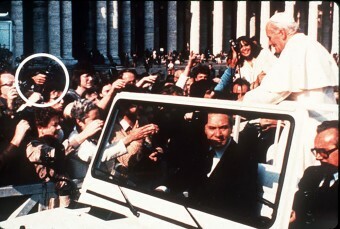 On May 13, 1981, Pope John Paul II was shot while passing through St. Peter’s Square in Rome. The pontiff was on the way to hold his weekly public audience. After the shooting, the gunman’s weapon was knocked out of his hands by onlookers who restrained him until police could arrive. John Paul II, the first ever Polish pope who broke the 456-year Italian monopoly of the papal throne, sustained a wound to his abdomen and his left hand. A third bullet seriously injured an American woman, and a fourth hit a Jamaican woman. The pontiff required five hours of surgery that left him in critical, but stable, condition. After three weeks, the pope was fully recovered and discharged from the hospital. Four days after the attempt on his life, he offered forgiveness to his attacker, 23-year-old Mehmet Ali Agca, who was involved with the Grey Wolves, a right-wing Turkish nationalist organization. The group was thought to be behind the deaths of hundreds of union organizers, activists, public officials and others of a leftist bent. Western imperialists who are afraid of Turkey’s unity of political, military, and economic power with the brotherly Islamic countries are sending the Crusader Commander John Paul under the mask of a religions leader. If this ill-timed and meaningless visit is not called off, I will definitely shoot the pope. This is the only reason that I escaped from prison. Not a lot of gray area there. Security was tightened in Turkey when the Pope came a-callin’, and all went smoothly. Agca was convicted of murder in absentia since no-one knew where he was. Again, Agca spells it all out for us. He insisted he acted alone, pled guilty, and was sentenced to life in prison. He served his sentence until Italy pardoned him in 2000 at the request of Pope John Paul II. He was then extradited to Turkey, where he was jailed until 2010. In December 2014, Mehmet Ali Agca traveled back to the Vatican to pay his respects to the late Pope John Paul II. 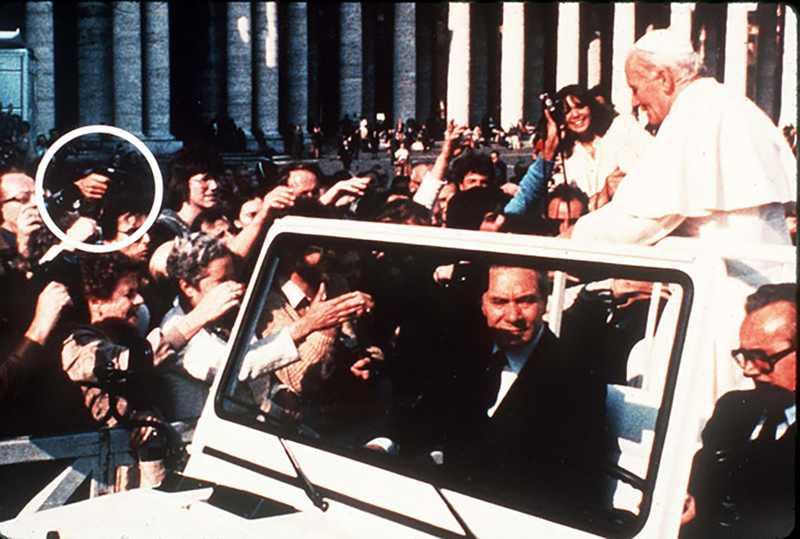 He stood in silence by the Pontiff’s tomb in St. Peter’s Basilica for several minutes and left two dozen white roses. “I felt the need to make the gesture,” Agca explained. I wish to correct the multiple errors in one statement, lest readers be misled. It is rather amazing to me that the author could have made so many mistakes. (2) The quoted statement implies that the pope was struck by two bullets (or one bullet twice). In fact, the would-be assassin fired four shots, and ALL of them hit the pope. One bullet hit his left index finger before striking one of the women. One bullet hit his right arm before striking the other woman. Two bullets hit his abdomen and lodged in his lower intestine.